Looking for the cheapest trucks, the least expensive, lowest price trucks you can find? Your best bet is a good used truck that’s only a few years old. Selecting a 2008 or 2009 used truck with few frills – but ample power for your needs – should give you a lot of truck for the lowest price. Of course, everyone’s taste is different. If you hanker for the latest styling, tons of amenities and optional equipment, you won’t find it in the cheapest trucks. Nope, these trucks have just the basics, but they’ll get you where you need to go. Our choices for Best Cheapest Trucks may be a bit different than yours, but they’re a good starting point. These three are all compact pickup trucks, the least expensive out there (plus a few other commendable points). Chevrolet Colorado – In Work Truck (regular cab, 2-wheel drive, 6-foot cargo bed) configuration, the Chevrolet Colorado, more midsize than compact, is affordable and has style plus 185-hp 2.9-liter Vortec inline 4-cylinder engine and 5-speed manual transmission with overdrive. Edmunds says it is “affordable” and “attractively styled,” but “engines lack power compared to rivals, mediocre towing capacity.” Still, Colorado’s “affordable price makes it particularly appealing to budget-minded truck buyers.” Consumer Guide says Colorado and sibling GMC Canyon “focus on casual pickup users… Given that mission, these are useful, well-balanced small trucks.” Base starting prices range from $13,056 (2008) to $16,705 (2009). 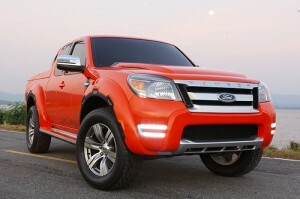 Ford Ranger – Best-selling compact truck for 17 years, Ford Ranger (in XL Styleside 2WD configuration), is one of the lowest priced trucks around, and comes with a 143-hp 2.3-liter inline 4-cylinder engine and 5-speed manual transmission with overdrive. Edmunds comments “With Ranger’s solid reliability record…lower pricing than comparable Japanese models, a well-maintained late-model Ford Ranger makes for a respectable choice in the used vehicle market.” U.S. News & World Report says Ranger “offers capability for buyers on a budget.” Look for base starting prices of $11,627 (2008) to $16,395 (2009). Mazda B2300 – Essentially the same as the Ford Ranger, B2300 is Mazda’s smallest compact truck, powered by the same 143-hp 2.3-liter inline 4-cylinder engine, mated with a 5-speed manual transmission with overdrive and floor-mounted shifter. Edmunds calls its chassis “old,” but “it’s rugged, making it ideal for folks who need a no-frills workhorse, or for outdoor enthusiasts who want to indulge in their activities without spending a lot on a truck.” Edmunds lists B2300 as Lowest True Cost to Own in trucks. Kelley Blue Book says “If you need a compact pickup that is inexpensive to own and operate, but want something a bit more stylish than the Ford Ranger, the 2009 Mazda B-Series is your best bet.” Look for base prices ranging from $12,863 (2008) to $16,060 (2009). Other least expensive trucks to check out include Toyota Tacoma, Suzuki Equator, and GMC Canyon (sibling to Chevrolet Colorado). For midsize cheap trucks, consider Dodge Dakota and Mitsubishi Raider, and for full-size trucks, look for base level models of Dodge Ram 1500 and Ford F-150.